After your graduation you join the ranks of over 200,000 other former students worldwide and will remain a valued member of Nottingham Trent University's Alumni Community. Membership to the Alumni Community is free and automatic. * We really want to keep in touch with you. All you need to do is remember to keep in contact whenever you move on personally or professionally – we really want to hear about it! It’s easy to keep in touch. Just join Venture, our Online Community - a secure password-protected environment exclusive to NTU alumni. You can also keep up to date with news from NTU by joining us on Facebook, LinkedIn, Twitter and Instagram. What can the Alumni Community do for you? Did you know that you can continue to use the services of NTU's Employability Team for up to three years after your graduation? You can enjoy many other benefits through the Alumni Community, including free membership to the University's libraries, discounted sports membership, the free alumni magazine Network... and more. 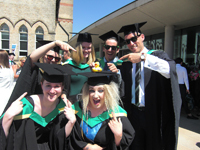 More than 15,000 graduates from previous years are already using the alumni online community, Venture, where you can search for Nottingham Trent friends, add messages and photos, get involved in discussions and professional networking, and update your details, all in a secure password-protected environment that is exclusive to Nottingham Trent alumni. Read more about the online community here. *Please check our Membership Guidelines for more details. NTU has been such a big part of your life. Don’t let it just be a part of your past, but also your future. Keep in touch!